We’re thrilled to be partnering with Conductor to deliver a smarter, faster way to reach and engage with international audiences. 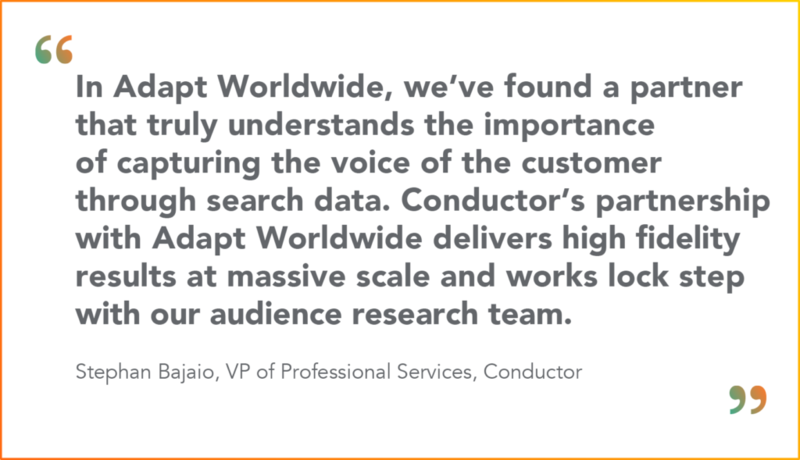 Our partnership integrates the best of Adapt’s multilingual digital content services with Conductor’s platform for SEO and content marketing. Conductor’s technology is used by leading brands such as Citibank, SAP, and Black & Decker. Our partnership creates a data-driven solution that enables digital marketers to harness global keyword research in over 225 languages. The foundation of enduring partnerships is shared business values. Conductor is all about customer-first marketing, and this is also Adapt’s work at our core. In today’s competitive, noisy marketplace, brands must effectively engage in meaningful ways with customers on a local, regional, and global scale. To drive customer engagement, culturalization or localization has become increasingly important as part of the content creation and optimization lifecycle when expanding into new markets. Multilingual content needs to balance appealing to the widest audience while providing a personal voice, local context, and cultural relevance. When expanding beyond English content, marketing teams need to enhance their knowledge of local audiences and markets, including keyword research. SEO is all about visibility, and on-page SEO continues to be the cornerstone practice. As many brands are realizing, international SEO is more than a straightforward translation of pre-existing digital content. The additional research process in culturalization or localization is critical to avoid costly content mistakes. 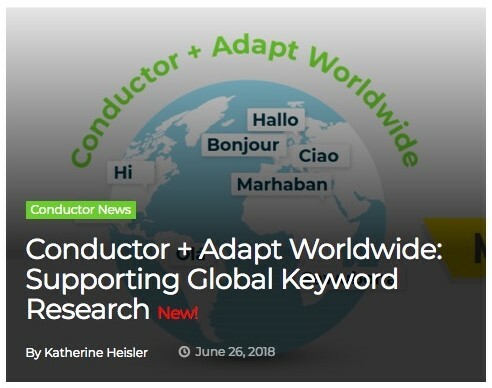 Global SEO and digital content localization are indeed challenging, and that’s where Conductor and Adapt’s partnership comes into play. We’re here to support you with multilingual content expertise to research, discover, and analyze what matters to global audiences. Let’s embrace the power of generating engaging content that is global-ready and performance-optimized. Shall we begin that journey of understanding new markets and new customers together? Meet with our digital marketing experts at C3 Conductor in New York, 6-8 May 2019.